"A friend of mine from work gave me this recipe. 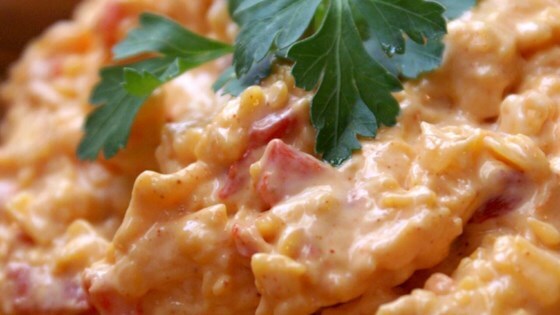 It is so easy and delicious and I don't usually like pimento cheese. Enjoy!" Stir together the Cheddar cheese, pimentos, and garlic powder. Stir in the mayonnaise a little at a time, until the spread reaches your desired consistency. Refrigerate for 2 hours to let the flavor develop. A teaspoon of garlic was WAY TOO MUCH. If you try this recipe, do not add a full teaspoon. It overpowered every other flavor in the pimento cheese. I couldn't even taste the pimento. Great recipe. I was raised on pimento cheese in NC, favorite was Stan's Pimento Cheese in Burlington. I put two jars of pimento in the one I make, never enough of the pimentos.